Now that summertime is in full swing, one word is on everyone’s mind: adventure. And while some may prefer a long hike or mountain biking, overland adventuring has become a popular way to explore the beautiful outdoors. Few know overlanding travels better than New Mexico Backroads founder (overland guide and 4WD trainer) Jake Quiñones. In this exclusive interview, we discuss how New Mexico Backgrounds got started, the importance of photography and social media, and Quiñones’ favorite gear for exploring. Innovation & Tech Today: What originally drew you to your current role with New Mexico Backroads? Jake Quiñones: During college, I took a job with Vermejo Park Ranch. This is where I was first exposed to the outdoor industry and eco-tourism. Vermejo is Ted Turner’s sprawling northern New Mexico-based preserve that is primarily geared towards sportsmen. I wasn’t a big hunter or avid fisherman, but I really liked the experience and concept of being outside and providing guide services. While my interests since being a teenager revolved around mountain biking, sojourn travels in the backcountry, photography, and 4WD trucks, I sought a different path with my ambitions to build a career that centered on adventure in the wild. In 2009, I founded New Mexico Backroads (NMBR). Today, NMBR provides professional four-wheel drive and overland [based] guiding, tours, scouting, skills training, and photography services to a host of enthusiasts, companies, and government agencies. I&T Today: Are there any areas in particular that are your favorite to focus on? Jake Quiñones: Although NMBR provides services in Arizona, Utah, Colorado, and Texas, the majority of my fieldwork is [obviously] New Mexico-based. Within New Mexico, my favorite and most frequently traversed region is the 3.3 million-acre Gila National Forest. I grew up camping and exploring around the Gila, some of my earliest memories include riding in my Dad’s Bronco along the Great Divide Trail and playing in the wading pools of the Mimbres River with my dog. What makes the Gila unique is its location in southern New Mexico; it’s a series of mountain ranges and sky islands surrounded by desert and arid lands on all sides. Most people who road trip through southern New Mexico, en-route to ski in Colorado or headed to the West Coast, think of the region as nothing but sparse desert. In reality, lush aspen groves, 10,000-foot peaks, and cool mountain streams can be found less than 50 miles from the I-25 and I-10 corridors. My personal and professional gravitation towards the Gila allows me to share with clients a unique perspective and vivid experience. I&T Today: I noticed that you document quite a bit of the scenery and some of these adventures on social media, especially through Instagram. What’s your general approach for that? Jake Quiñones: Photography is fundamental to most everything I do professionally. It’s how I captivate the adventures and services NMBR offers and it’s how I tell a story (using very few words) on social media. During high school, I took a big interest in photography after saving for and purchasing a Nikon N60 film camera. Much of the opportunity that has come to New Mexico Backroads has been individuals and companies that are familiar with my photography work. Magazine stories, advertisements, and social media features including my images have been a driving force to establishing NMBR’s name within the overland and outdoor industries. As a writer and magazine contributor, published stories about my personal and professional life have resulted in enthusiasts and companies wanting to experience the adventure just as it was depicted through my words and imagery. The underpinnings to my photographic style is simple—capture raw and real images that evoke the human desire to explore. If my images can transport someone for a moment or pull at them to plan their next great adventure, that defines the success of my photography work. This approach yields a favorable return as prospective clients envision themselves doing and seeing the things that I feature on platforms such as Facebook and Instagram and end up booking overland trips or remote training sessions. I&T Today: I was reading that one of the products that has really helped you out on your travels has been the Dometic CFX 40W. Tell me how that’s helped you out on your journeys. Jake Quiñones: Ten years ago, I was using an ice cooler for cold food item storage. Ice chests are unforgiving when it comes to rough road travels. I think we’ve all had that experience of opening the ice chest at camp only to find our food is waterlogged and our beverages are leaking due to miles of sloshing and pummeling in a slurry of ice. When I began guiding professionally and leading weeklong overland trips, relying on ice to keep food fresh was no longer an option. At that point, I made the choice to go with a Dometic fridge. For nine years and over 100,000-thousand miles of travels, that fridge cooled reliably and never left me stranded with a dead battery. When the time came to upgrade to a more advanced unit, Dometic’s CFX 40W offered a whole new level of efficiency and features. Another important feature of the CFX is its intelligence to sense when your vehicle’s battery is running low on power; it won’t leave you stranded. The fridge is able to regulate itself so that it shuts down in such an instance. Rather than waking up to a dead battery and dealing with such a situation in the backcountry, the fridge powers itself off. You simply start up your vehicle, turn the fridge back on, and you’re on your way. The CFX is well-insulated, so in most cases it can keep food relatively cool for a few hours without power. Even with the CFX’s efficiency, it’s always a good idea to regularly check your vehicle battery’s health and replace as necessary. I&T Today: What’s your go-to meal during these trips? Jake Quiñones: Being a New Mexican, many of the meals I’m preparing on the backroads definitely include a regional flair. My approach to cooking is to prepare hearty and healthy meals that utilize local ingredients as much as possible. You can’t talk about New Mexico’s cuisine without mentioning Hatch green chile (yes that’s chile spelled with an “e”). Hatch is a small community in southern New Mexico located along the banks of the Rio Grande. The town, known as the “Chile Capital of the World,” grows the most flavorful and meaty green chile available. I make it a point to incorporate Hatch green chile into meals where appropriate. Don’t worry, I’m not mixing peppers into pancakes. Some examples from NMBR’s dinner menus include griddle-prepared Fajitas with fresh chopped green chile (in place of bell peppers), New Mexico-raised Angus steak topped with roasted green chile strips and melted asadero cheese, and charro beans with sautéed jalapenos, onions, and garlic. The meal I enjoy cooking the most, and the most famed, is NMBR’s breakfast burritos. At sunrise, I fire up a three-burner stove with a massive cast iron griddle atop and pile on chorizo sausage, potatoes, green chile, jalapeños, potatoes, onions, and an ultra-secret blend of spices. The mixed aromas of the sizzling griddle, coffee brewing, and tortillas toasting seems to bring the heaviest sleeper out of their tent. People are always surprised at the variety and amount of food that I’m stocking in the fridge and the meals I’m preparing in the middle of nowhere. I&T Today: Outside of people that are really into overland travel, who would you recommend the CFX to? Jake Quiñones: The functionality of a CFX fridge is very mainstream. Anywhere someone is using a traditional ice chest in their vehicle, they would see the benefit with a powered cooler as ice has its limitations. My dad, that Bronco driving guy from the 80s, now drives a Prius. He travels about an hour away from home to shop at Costco in El Paso, Texas. He borrows my fridge when he plans on bringing back chilled goods, produce, and meats. The Prius’ battery handles the fridge without an issue; simply plug and play. My wife uses a CFX 50 in her truck for groceries and storing her lunch for work. Aside from family camping, we use the fridge for road tripping. With the CFX and cooking kit onboard, we are able to support a very nice meal plan by packing a variety of fresh food and resupplying along the way. Along with eating well, this allows us the freedom to enjoy almost any type of food anywhere we please. We are not limited by restaurants and grocery stores. My opinion is that it’s cheaper, easier, and healthier to eat this way. 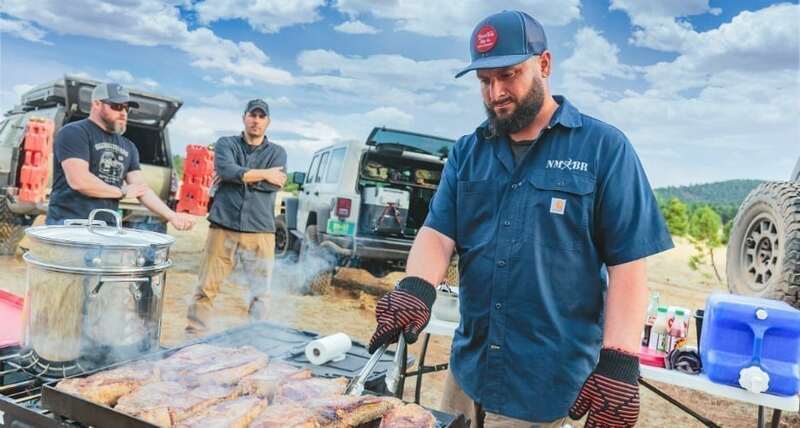 Imagine being able to pull off the road at a nice scenic overlook, deploy your camp chair, and enjoy a lunch you made with ingredients you packed from home. The CFX is definitely not just for overlanding. I&T Today: What advice would you have for anyone looking to get into and gear up for overland travel? Jake Quiñones: Am I willing to change a flat tire in the mud? How will I handle a mechanical breakdown or equipment failure in a remote location? How will I ensure the safety of my passengers and myself on a multi-day traverse? Is my vehicle, equipment, and gear up to the task? This is the under-belly of overlanding. These are the questions prospective overlanders must ask themselves first in order to evaluate their readiness for extended vehicle-based exploration of the backcountry. Many enthusiasts jump into overlanding head-first with vehicle upgrades and gear purchases before answering the aforementioned questions. My advice is that people educate themselves, build skills, and make the necessary preparations before they set off on their first epic expedition. Taking a first-aid and CPR class is a good starting point for the most basic preparations. Learn about vehicle recovery techniques and how to properly use recovery equipment. Consider signing up for a basic mechanics course at your local community college. At a minimum, have your local mechanic inspect and service your vehicle to reduce the risk of a backroads breakdown. Ask your mechanic to explain and give an overview of your vehicle’s various systems and components. Learn how to change oil, various filters, and how to perform simple inspections and checks. It’s best to familiarize yourself with your specific vehicle by researching common issues that may be easily addressed before issues crop up. Plan to attend an event like the Overland Expo in order to network with other overlanders and see vehicle upgrades and gear firsthand before you buy. Lastly, get professional training and guidance from NMBR or another reputable outfit. For me, the most basic definition of overlanding is adding purpose to each element of the adventure from planning, to the journey itself, to building skills and know-how from experiences.